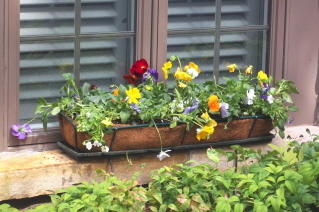 Using pansies in window boxes for winter color – Johntheplantman's stories, musings, and gardening. Dot Fletcher loves her window planters. I call them window boxes, but they are actually made of a wire frame with coconut fiber liners. We change these planters twice a year—in the spring we plant lots of begonias, bacopa, and similar plants for summer color. 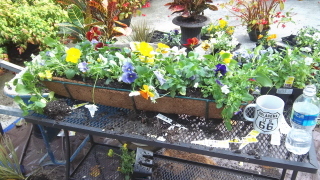 In October, when the begonia plantings still look nice, we change the planters over to pansies. I love pansies because of their hardiness and their ability to give us beautiful flowers throughout the cold days of winter. 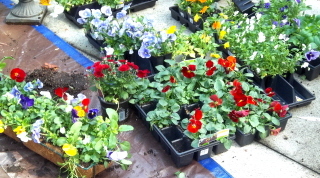 We started the project with a trip to a couple of local nurseries where we picked out just the right colors of pansies. I laid the trays of plants out on the driveway next to a tarp which would help to keep the site clean. 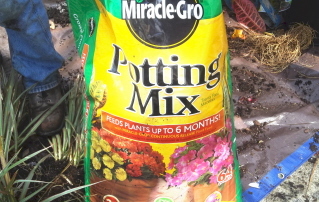 I bought a bag of premium potting soil. 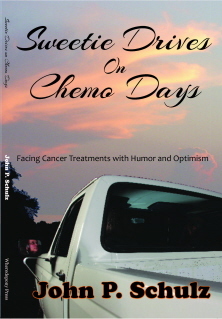 This particular blend from Miracle Gro is loose and easy to work with. 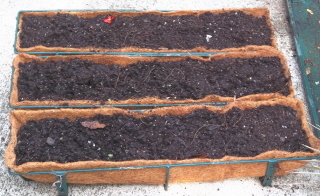 A good potting soil will allow air flow while still having a capacity to retain moisture. There were six planters. We changed out the liners and filled them with potting soil. 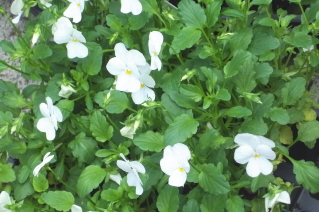 I had also gotten a couple of trays of violas. I love violas because they just keep on blooming. I thought these would be good for the corners and spots in the fronts of the planters because the violas tend to droop and run as they grow. 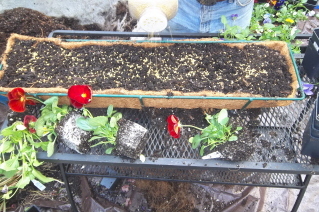 They will fill in the areas below the pansies. I used a tray of white and a tray of purple. We sprinkled Osmocote, a time release fertilizer, over the top of the soil before planting. The actual planting of the plants will mix the fertilizer into the soil and the fertilizer will work slowly all season long. 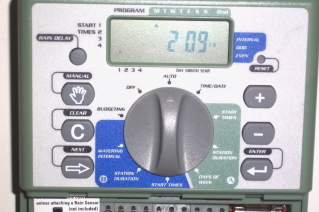 At this point, we’re ready to plant. I started out by planting the separate colors in groups of three and then finished up by filling in the blank spaces with whites. All of the planters were to look more or less the same, so I planted one for a prototype and then followed the design on the next five. 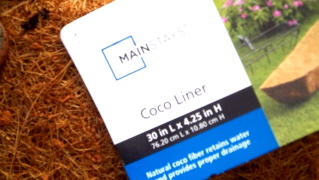 The coco mat liners allow for lots of air flow and that allows me to pack the planters with as many plants as I can find room for. We moved the finished planters to the windows. Dot told me that one of the best things I ever did was to install the system of drip stakes for the window planters. 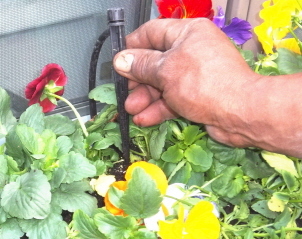 There are two stakes for each planter which are attached to tubes which come up from a drip system at the base of the wall. The drip stakes run for 7 minutes every other day and are controlled by a simple, inexpensive, and easily installed Orbit timer that I found at Home Depot. The pansy planters look good in the windows. The plants and flowers will droop a bit at first but will pick up and look pretty after a couple of days of sunshine. Do you have a landscaping problem that needs solving? Leave a comment.